Star Trek has never really been about its villains. Even the Klingons, Romulans and Borg have provided object lessons about understanding. Kirk had foils more than he had villains. So it's no surprise that when Trek tries to do baddies, it frequently stumbles. Here are the 10 least dangerous Trek villains of all time. Note: We debated pretty endlessly which bad guys belonged on this list. It could have been all one-shot Original Series baddies. It could also have been nothing but random antagonists from Next Generation season two. We also left out baddies that were intentionally weak, like the Pakleds ("Make it go"), or just bizarre, like the cheese on Voyager. We debated whether the Holodeck counts as a villain. So here's what we came up with. Please share your own picks below! The Breen were one of the bigger letdowns of Star Trek. Introduced as this unstoppable new alien race that we've somehow never heard of, they join the Dominion war and turn the tide in the Dominion's favor. They're sort of like Princess Leia's "bounty hunter" disguise in Return of the Jedi. And the Breen... never seem to add up to much. They're built up as this formidable opponent, and then they just fade out. They have this one energy-dampening weapon that the Federation has no defense against... until they figure out a defense against it. Then the Breen are suddenly no big deal. Really, almost every space god the Federation ever encounters is kind of sad and pathetic. Apollo, Trelaine, Charley X, Plato's Stepchildren, Ardra... anyone who's not Q is kind of a waste. You find their magic doohickey or whoever's pulling their strings, and then they're over. But the weakest god of them all is probably God himself, as encountered on the planet Shakaree. He needs to lure travelers to his planet, where he's apparently trapped, and when he's called on his BS he pretty much just has a bit of lightning and some feeble rock monsters at his disposal. Kirk pretty much demolishes him just by asking what God needs with a starship. We had so many one-shot TOS villains on this list. At least a third of the one-shot villains in TOS are just excuses for Kirk to swagger his way through another supposedly no-win situation. But we still have to pay special attention to the space hippies in "The Way to Eden." Partly because they're such dreadful wankers, with their bicycle-wheel jam sessions and penny-ante philosophy. Their main weapon seems to be calling Kirk "Herbert." People take over the Enterprise with alarming regularity in TOS — but these guys are among the least credible hijackers, and it's not surprising that they're so easily dealt with. Oh, and they didn't bother to use a tricorder to test the damn fruit on their Eden planet. Idiots. TNG, also, boasts a number of absolutely pathetic one-shot villains. We considered the Antedeans, the fish-headed creatures who try to disrupt a peace conference. And the Bynars, whose main scheme seems to be seducing Riker with his ideal woman. (Protip: You can seduce Riker with some drier lint. You don't have to work that hard.) We really wanted to include Ronin, the Anne Rice knock-off from "Sub Rosa." But we had no room for those villains, and they're just averagely terrible. Sela, meanwhile... she's obviously supposed to be extra scary, because she's a Romulan who looks like Tasha Yar! So she has all of Tasha Yar's badassery and all of your average Romulan's cunning. And... I'm not even sure what happens. Sela is built up over several episodes as the new "big bad," and then she succeeds in capturing Picard and Spock and planning the invasion of Vulcan. And she fumbles the ball so badly that the real Tasha Yar would be horrified. And here's another one-shot villain that we just cannot ignore. Some scientist types get trapped in a holographic realm where they're tormented by a clown who represents the ultimate manifestation of fear. And... he's like a weak borscht belt comedian, or something. He's the least scary scary clown we've ever seen. He mostly seems whiny and annoyed that nobody's scared of him. He does age Harry Kim into an old man and then turn him into a baby, which is the most character development Harry Kim ever got. But Janeway outwits him (hesitate to use the word "outwits" because that implies the presence of wits) with ridiculous ease. We still don't really understand the Temporal Cold War. Maybe nobody does. The producers have said several times that they didn't want to do a big time-travel storyline on Enterprise, but the studio forced them to include it. In any case, the Temporal Cold War went on for a few years, during which we never learned who Future Guy was, and Scorpius from Farscape showed up a lot. And the Temporal Cold War turned into sort of a 9/11 allegory, and we had to go fight the Xindi... and it all led up to a huge conclusion, in which we had to go back to World War II and fight alien Nazis. These alien Nazis were actually weaker than the alien Nazis on TOS or Voyager. They had some plan to provide weapons of mass destruction to the Nazis, but they were kind of pathetic wannabes. Archer and Scorpius basically take them down single-handed. Fun fact: Ru'afo, the plastic-surgery-addicted alien who wants to retake his old homeworld and suckers some Starfleet admirals into helping him, was originally named "Joss." If you read Michael Piller's (incredibly depressing) unpublished book about the making of Insurrection, there are tons of script notes and letters from Patrick Stewart, asking, "What exactly motivates Joss to try and take over the planet of the young people?" And pointing out that Joss is kind of a bland, one-note villain. Sadly, even after his name changed, Ru'afo never stopped being a terrible one-note baddie. His main thing is that he's a wacky satire on plastic-surgery victims, something Brazil did way better a decade earlier. He's only really a serious threat because of those aforementioned Starfleet admirals. 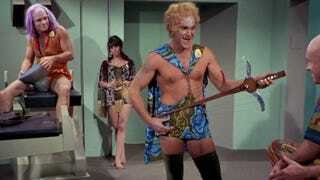 And finally... one last one-shot TOS villain. The last ever TOS villain, in fact. She's Kirk's ex-girlfriend who didn't get to be a starship captain because of sexism, so she traps Kirk in a body-switching device and steals his body so she can command the Enterprise. This is actually a pretty rock-solid scheme. She gets points for ingenuity. But once she has Kirk's body, she can't just play it cool. She has to start acting like a bizarre stereotype of a hysterical lady, eventually alerting Spock and McCoy to the awful truth. It's not like impersonating Kirk requires any dignity or anything. She could have pulled it off. We spent wayyy too long with the Kazon. Way too long. They were these grouchy aliens who had a chip on their shoulder because Voyager wouldn't just hand out its advanced Federation technology to them, and because their technology was so backward, they seldom posed much of a threat to Voyager. Until Seska, the Voyager officer who's secretly a Cardassian spy among the Maquis, decides to join them for no reason that makes sense. And even then, Seska's main weapon is pretending that she stole Chakotay's DNA and had his baby. Which is enough to let her take over Voyager for a day or two. On the plus side, they're smart enough to evict the Voyager crew from their own ship, which is more than the space hippies ever thought of. But for all the build-up the Kazon received, they were seldom more than annoying. Why couldn't Voyager have found itself on the other side of the galaxy, dealing with more advanced races? There could be no other choice for #1. Because Trek really really wanted the Ferengi to be the scary new aliens, when TNG launched. The first season of TNG contains several attempts to inspire fear of these big-eared ultra-capitalists, who snarl at Riker and try to drive Picard insane. Just like Ru'afo was some kind of misguided cautionary tale about not getting too much cosmetic surgery, the Ferengi were like the ultimate manifestation of Gene Roddenberry's "hey, man, capitalism is evil" idea. They were supposed to be the new Klingons, except avaricious instead of violent. They fizzled so badly that the shows changed gears drastically and turned them into comic relief, a role they occupied for years on TNG and DS9. All screencaps via TrekCore. Thanks to Katharine, Mark, Esther and everyone else who helped with this!